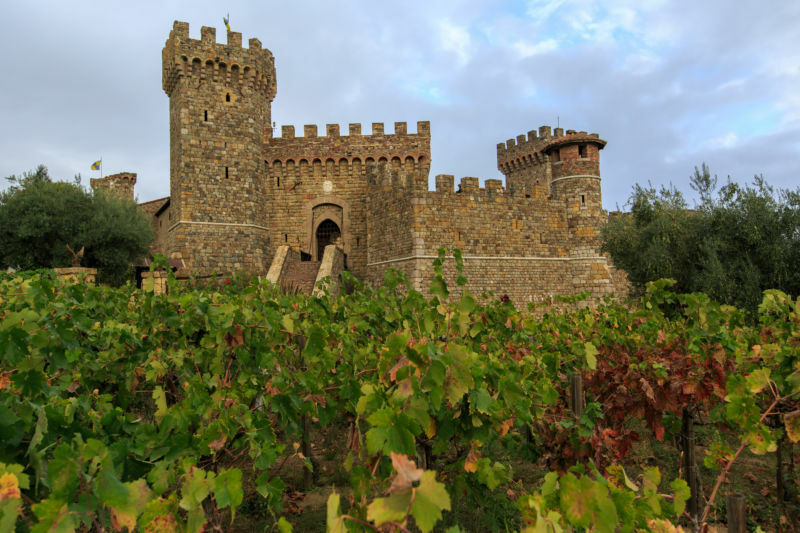 I was invited to an event to celebrate Ten Years of Castello di Amorosa; the beautiful Italian Castle that sits in the hills above Calistoga in Napa Valley. 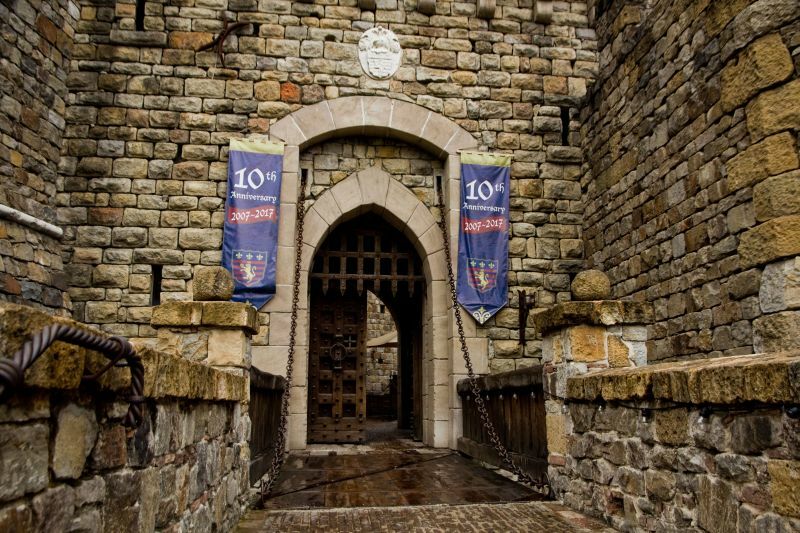 I knew that the castle was new, but there is still something odd when you see banners proclaiming 2007-2017 on a building that looks like it has sat there for centuries. The truth is that this was a passion project for Dario Sattui, owner of V. Sattui winery further down Highway 29. The event was held on Thursday, April 6, although the day that the castle opened to the public was April 7, 2007, so we were a day early. The event started with sparkling wine; bone dry with flavours of apple and a hint of mown grass. We sipped the wine as we strolled around the courtyard, sampling appetizers, and meeting with the artisans who had worked so hard to create this spectacular setting. California Girl comments: I was in Europe and missed this gorgeous event. Oh, I am not bitter, nooooooo. I have to say that it looked absolutely spectacular and I am sorry I missed out. Congratulations to Dario Sattui and all of the staff for this amazing accomplishment. 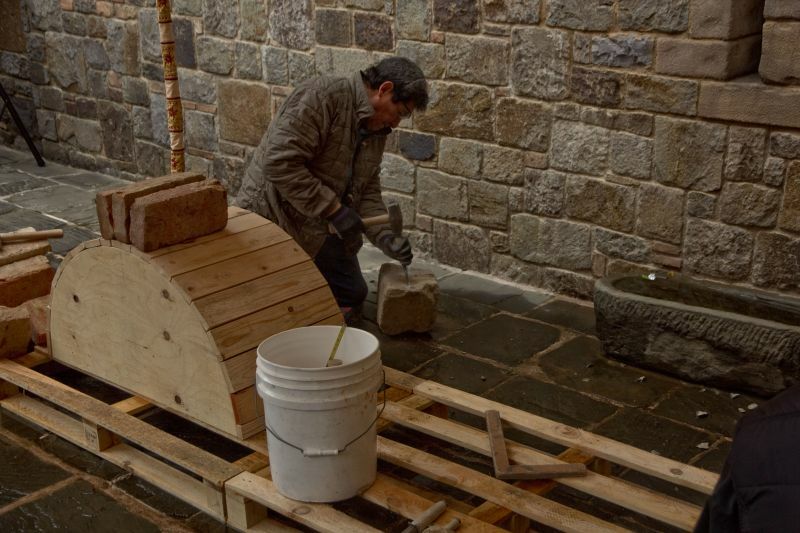 Fritz Gruber, a brick artisan from Austria, had trained local workers in the art of stone masonry. We could watch as a couple of these stone-workers cut square stones with a hammer and chisel. This careful craft made even more impressive as you looked around the square and realized just how many blocks had been created with this painstaking process. 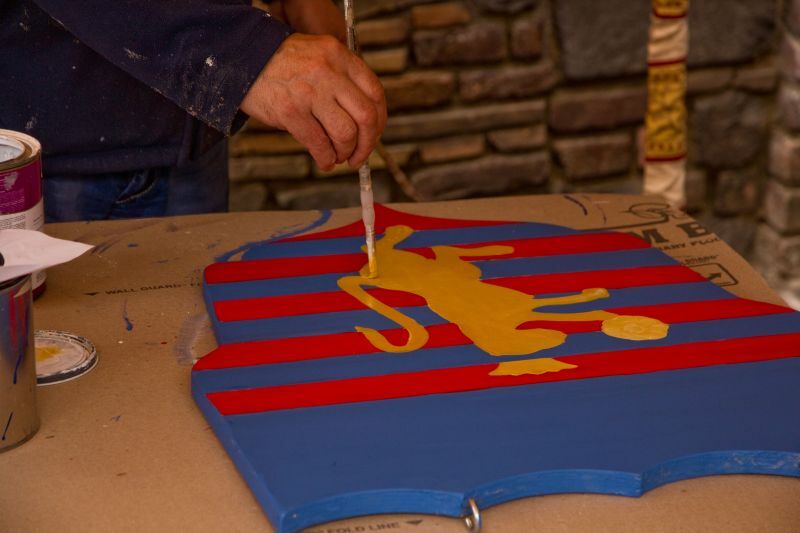 Fabio Sanzogni, an artist from the Italian Alps, was working on painting a crest to mark this tenth anniversary. He was the artist responsible for the stunning Great Hall. He explained that the paints he used were not genuine for the era, as too many of the ingredients of such paints were too toxic for modern regulations. Giorgio Mariani and his son had been responsible for much of the intricate ironwork that decorates the castle. 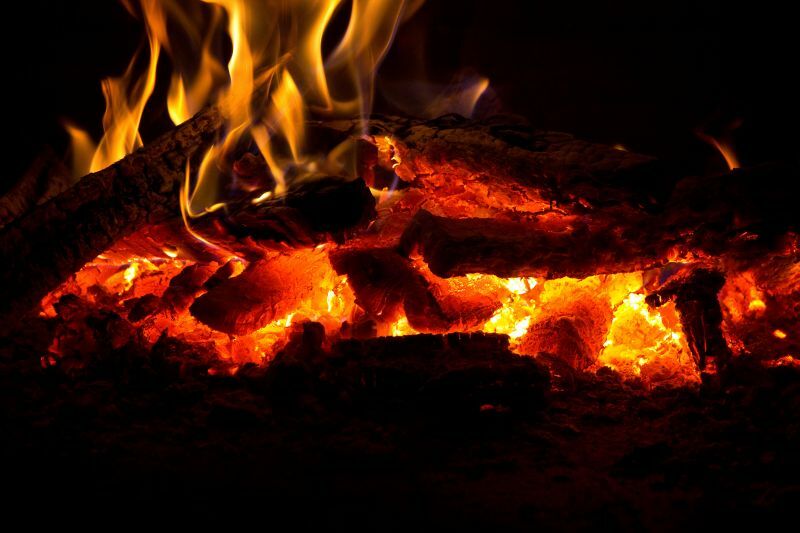 On this occasion, they were using an open-flame furnace to heat metal and then beat it into shape. A slow, painstaking process that combined artistry and physical exertion as a sledgehammer was repeatedly swung. I had a fascinating chat with Jon Lail, the lead architect on the construction project. He discussed the challenges of constructing a medieval Italian castle in an era when buildings need to meet code and comply with American with Disabilities Act. Plans to have steps made so that the centre was worn down as though by centuries of feet had to be abandoned. Clever engineering was needed to ensure that doors weighing six-hundred pounds could be opened with a lot less pressure than would be the case for the originals on which they were modeled. Jon emphasized that on every part of the project, Dario’s stamp was present. After an hour of observation, listening, sipping, and tasting, Dario Sattui stepped up to talk about the construction of the castle. He had purchased the one-hundred and seventy-one-acre site because it has the permits needed to build a winery for which reservations would not be needed. This was the last site in Napa Valley to have that type of public permit. Dario’s plan was to create small lots of Italian style wine. 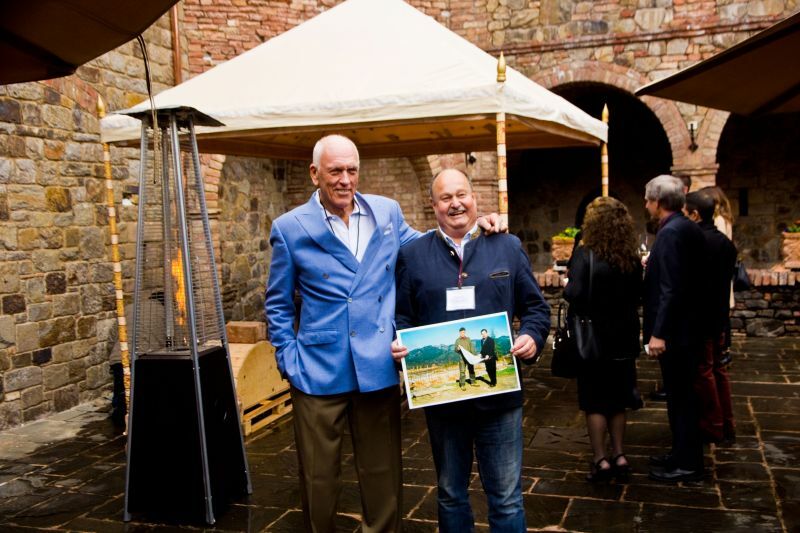 Originally, he had intended to put an 8,500 square foot building on the site; Castello di Amorosa is a 120,000 square feet. The project clearly grew in scope and scale. Dario explained how much he loved exploring Italian castles. monasteries, and farmhouses armed with a camera, sketchpad, tape measure, and hammer. The last of these tools helped Dario gain entry to locked, abandoned buildings. Dario would also dress up in expensive looking clothes to visit a realtor and pretend he had the funds to purchase the property. It was this passion fueled learning that Dario drew upon when he decided to build an Italian-style Castle on the property. Originally, the plan had been to construct a monastery, but with a twinkle in his eye, Dario asked which boy would not prefer a castle. He provided a little more justification for the choice saying that many great European wines were made in castles. During construction, some two-hundred containers were shipped from Europe with furnishings, fixtures, and construction materials from Austria, Italy, and Albania. There are eight thousand tons of stone; all squared by hand with hammer and chisel. There are one-hundred-and-seven rooms across eight levels, with 70% below ground. Whilst it opened to the public in April 2007, it was not fully finished until 2009. It was with obvious and genuine enthusiasm that Dario described his love for Italian architecture and how that passion led to the construction of this beautiful castle. Dario then led us down to one of the barrel rooms underground where we tasted ten years of Il Barone Cabernet Sauvignon; the flagship wine of Castillo di Amorosa. This was a fascinating experience, which deserves a full post of its own. After the vertical tasting, we were led up to The Great Hall where we enjoyed a lunch prepared by Stefano Masanti, an Italian chef whose restaurant, Il Cantinone in Madesimo is Michelin starred. Stefano had been flown in specifically to cook this lunch. This party of the celebration is also worth its own post. 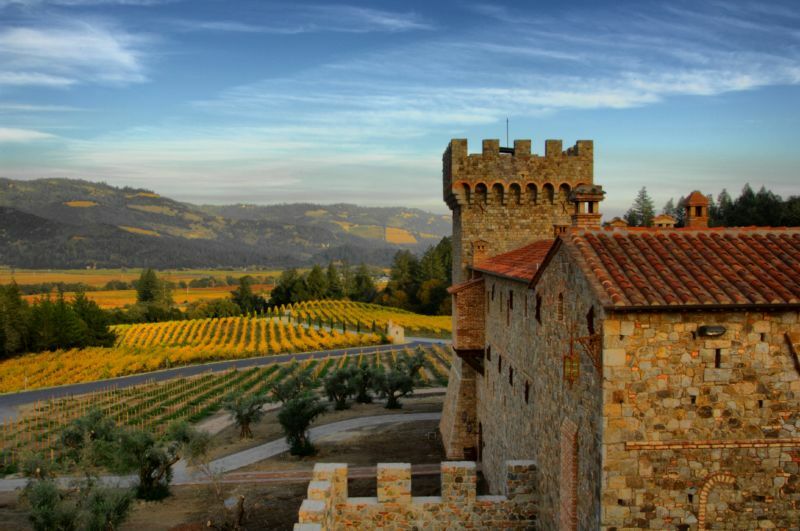 Beautiful Castello di Amorosa photo credit: Jim Sullivan. 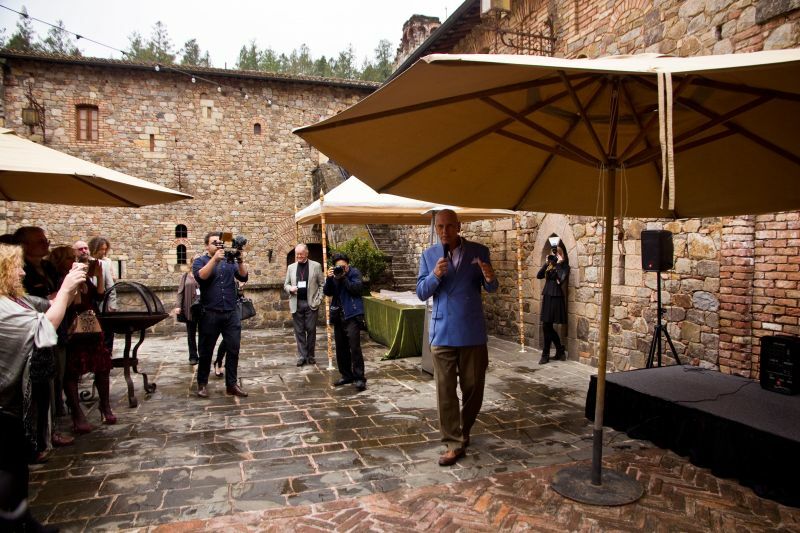 This was an ideal way to celebrate Ten Years of Castello di Amorosa; revel in the architecture, sample the wines, and hear the passion of Dario who provided the vision behind the enterprise.